What is Any DVD Copy featuring? Any DVD Copy embraces user-friendly interface and achieves something beyond your imagination, copy-protected DVD is no longer a problem stopping you from enjoying 720P videos on your TV/PC and cutting-edge handsets like iPhone/iPad/iPod/Galaxy Tab, Motorola Droid XYBoard and more awaiting you to discover. Burning DVD folder or ISO Image File from hard drive to blank DVD disc is another important feature to Any DVD Copy. Any DVD Copy enables you to preview the DVD before you clone, rip, shrink, decrypt, backup and burn. Only Three steps are needed: Insert > Customize > Output. Any DVD Copy facilitates you to backup, burn, clone, copy, decrypt, rip, shrink your encrypted DVD to blank disc, folders or ISO files on hard drive, Any DVD Copy removes CSS, RC, RCE, APS, UOPs, ARccOS. Any DVD Copy can copy single-layer (DVD-5)/dual-layer (DVD-9) to single-layer (DVD-5)/dual-layer (DVD-9), shrink dual-layer (DVD-9) to single-layer (DVD-5), DVD+R/RW DVD-R/RW all are supportable. 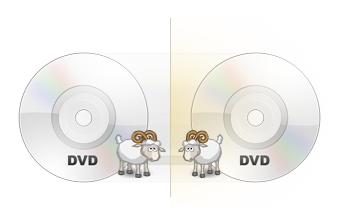 Both DVD-5 and DVD-9 are supported. Any DVD Copy also supports backing up encrypted DVD on hard drive as DVD Folder(Video_TS) or ISO Image File with high quality. After you buy a copy protected DVD, you love it, and you want to share it with your friends, why not just make a copy of it with Any DVD Copy? Only three steps are needed to make it real with an efficient way: Open DVD, Customize, and Start. Enjoy and share all the good movies! With Any DVD Copy, you can backup, burn, clone, copy, decrypt, rip, shrink both old or newly released encrypted movie DVD to your Android devices such as Galaxy Nexus, HTC One, Motorola Droid XYBoard, and iOS devices like iPhone 4S, the New iPad, iPod and others with which all the converted videos are compatible. Any DVD Copy supports ripping copy DVD with copy protections to five different commonly used video formats including MP4, MKV, and M4V, which are compatible with all handsets like mobile phones, tablets, etc. What if you want to enjoy DVD movies on your stylish smart phones? Any DVD Copy is the most satisfying solution for your ultimate enjoyment by ripping all the DVD movies to M4V, MP4, and MKV for your handsets. All the titles or chapters are not what you need, you want to rip the ones by checking without any annoying commercials, just select Start Title and End Title. Any DVD Copy furnishes flexible customization which enables you to customize titles, chapters, main movies, menus, special clips, languages. You can resize, crop the video, customize audio and video settings. All set with convenience and efficiency. Enjoy your unique videos anywhere. Chinese Traditional and Spanish are added to Any DVD Copy as operation languages from the new version released on 31, May.